I provide affordable website and web app design services to businesses and organizations. My portfolio lists previous apps and sites I've designed. My pricing is fair and competitive. My name is Chris Troutner. 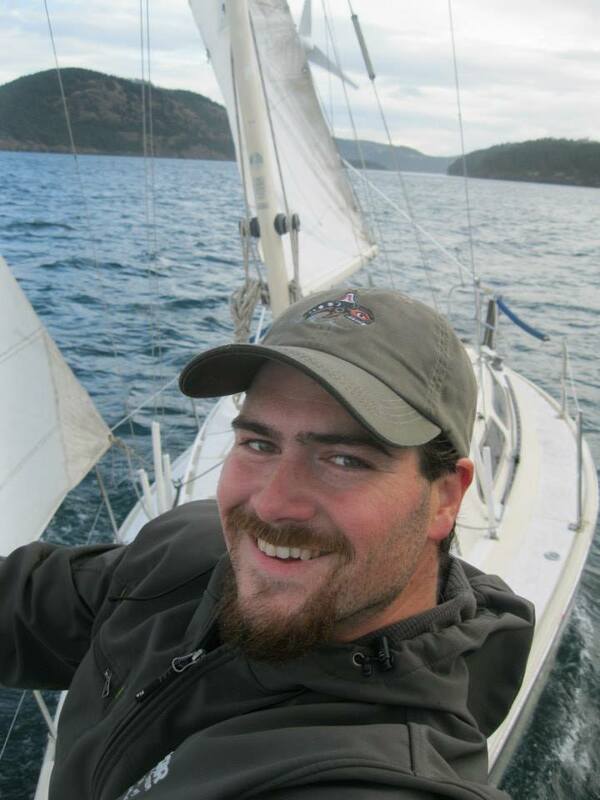 Thanks to modern technology, I live and work from my sailboat, located in the San Juan Islands of Washington State. I regularly video conference with clients via Skype or Google Hangouts. Though physically distant, I am only a phone call or email away. I make an effort to be prompt and professional. As reflected in my pricing structure, my goal is to provide long-term, reliable website support to small and medium-sized organizations. I am an expert in website and web app design, with over a decade of programming experience and a Computer Science degree from Oregon State University. I am the internet expert your organization needs. Below is a collection of websites and web apps that I've designed recently. Click on a category to filter by the type of project. A time accounting application for cooperatives. 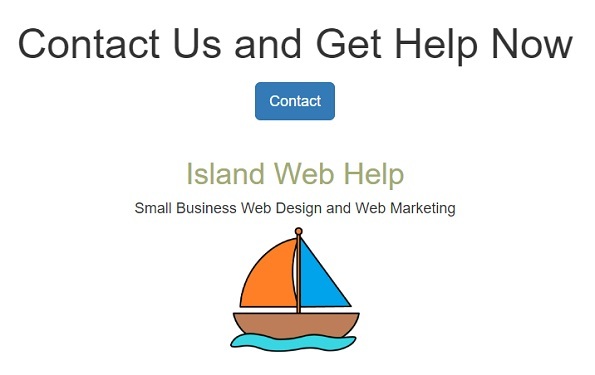 Add an animation to your website to focus attention on a 'call to action' area of the page. I have three pricing structures for my freelance work. I prefer to establish long-term working relationships with my clients, and so working on retainer incentives both of us to work toward that goal. I also do a fair number large projects such as new websites and website redisigns. For these kinds of new, large projects, I charge a minimum of 15 hours. A minimum retainer of 5 hours per month is required for this pricing structure. The retainer can be canceled after three months. Any work beyond 5 hours is still billed at this lower rate. No minimum requirement in time is required when working on a freelance basis. Up to 15 hrs of development. Let's start a conversation! Use the form below to contact me. I generally respond the email faster than voice mail. If you prefer phone, please leave a voice mail if I am not able to pick up the call. This website is a graphic-heavy with very little text. 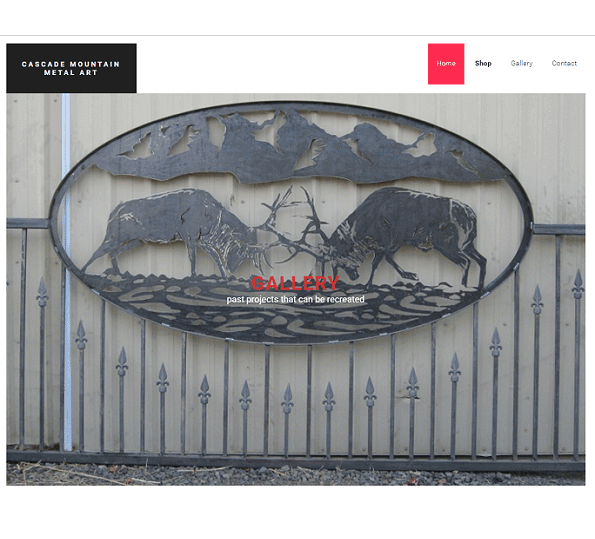 The purpose of the site was to function as a virtual gallery for the artist to show off his work. Fading animations and carousel sliders are used to provide interactivity and inspire the viewer to click through to view the different art pieces featured on the site. Unfortunately, the artist has let the domain name expire, but a local copy of this site is still available. WellFuture is a Shopify e-commerce store that sells probiotic supplements for kids. Dr. Clinton, the owner, maintains a blog. When new blog entries are posted, they automatically get emailed to clients who have signed up to receive her newsletter. Like all sites I build, this store is designed to run smoothly on a cell phone. The overall theme is bright, happy, and kid-friendly. A screenshot of the ConnextCMS dashboard. I built ConnextCMS to overcome several limitations clients have experienced with conventional content management systems (CMS) like WordPress and Shopify, but the user interface (UI) retains the same intuitive layout that users of those platforms have come to expect. 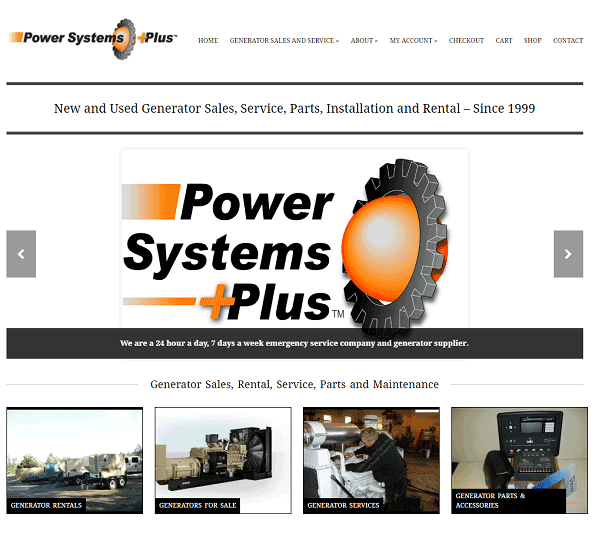 Power Systems Plus is a generator sales, service, and part company based near Portland, Oregon. The site is built on top of WordPress and uses the WooCommerce plugin to handle shopping cart functionality. 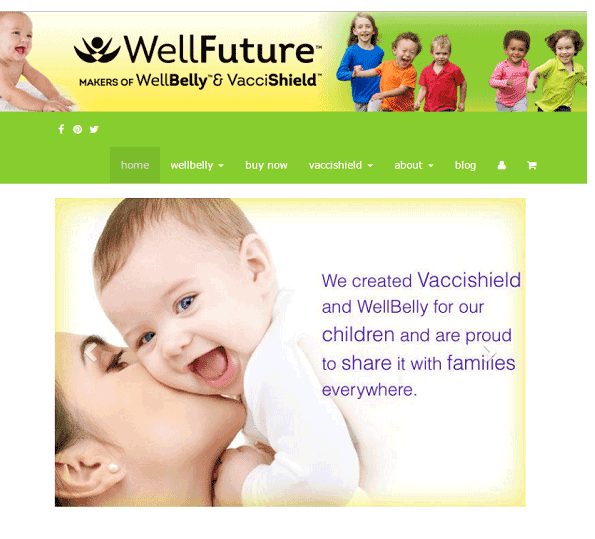 The site is responsive, making online shopping as easy on a cell phone as it is from a desktop. 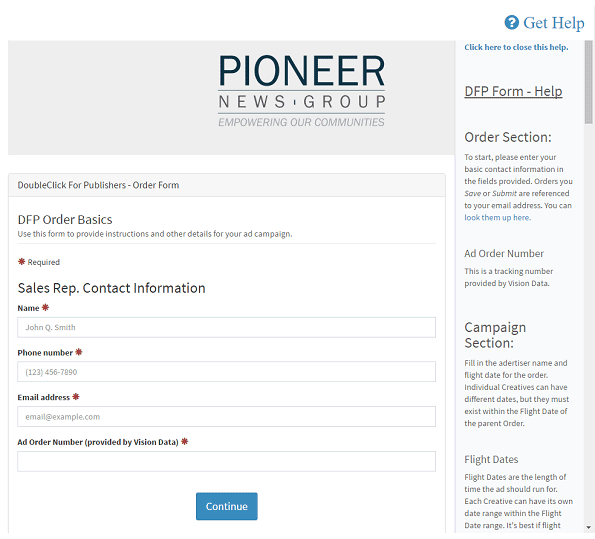 A screenshot of the order form and help system. Pioneer News is the parent company of about a dozen local newspapers in three different states. I was hired by Pioneer to develop a sophisticated order form used to coordinate advertising between their child companies. Data in this form is then passed along to the SiteScout Real Time Bidding (RTB) or Google's DoubleClick for Publishers (DFP) advertising systems. Data is saved in real time as the form is filled out. If an error occurs due to browser or OS incompatibility, a log file is emailed to the administrator (me). Image and video uploads are validated against size and dimension constraints prior to upload. Using jQuery animation, a slide-out contextual-help screen automatically scrolls to the help you need based on your location within the form. Various parts of the form are hidden or shown based on decisions made higher up in the form. Old orders have the ability to be cloned and re-ordered with a couple clicks. Unfinished orders can be saved and resumed at a later date. An admin dashboard allows fulfillment staff to monitor and process new orders in real-time. Orders can be updated and changed at any time during the work flow. An integrated auditing system tracks and timestamps every change. A promotional animation like this is a great way to call attention to a specific area of your site like a 'Buy Now' button, sign up form, or phone number. I can design and build this kind of animations and deploy them on your existing site. 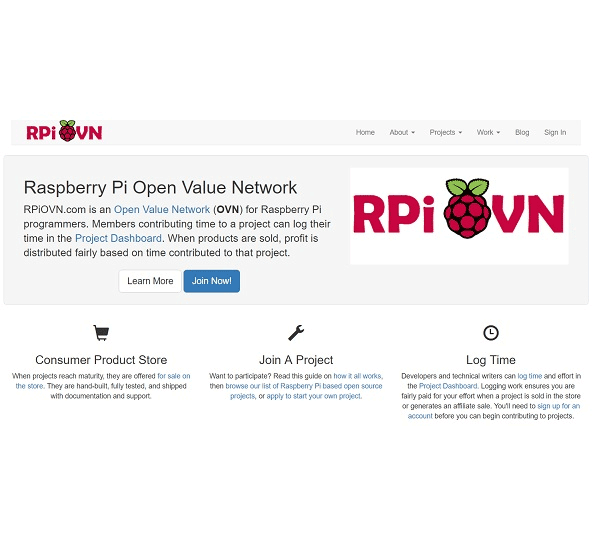 RPiOVN is an acronym for Raspberry Pi Open Value Network. It's a cooperative for programmers of the Raspberry Pi minicomputer who use it to develop new applications and appliances. 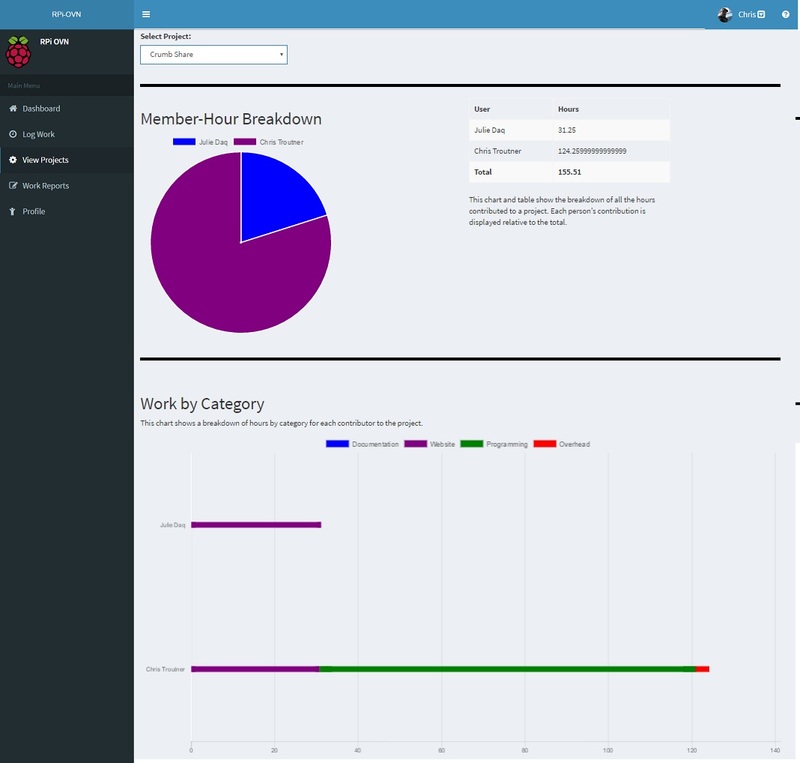 The RPiOVN dashboard pictured here is used for members of the cooperative to track the amount of time they've contributed toward a project. Hours are accounted and profit is distributed fairly. All time tracked is transparent to all members. If that sounds complicated, it is. You should probably just create an account and check it out for yourself. I created RPiOVN.org after working with similar software used by Sensorica and studying the phenomenon of Open Value Networks. It's a sophisticated web application that does on-the-fly accounting and data visualization. Work entries are stored in a database. Records can be viewed and even downloaded in Excel format by members. I've published all code as open source on GitHub. 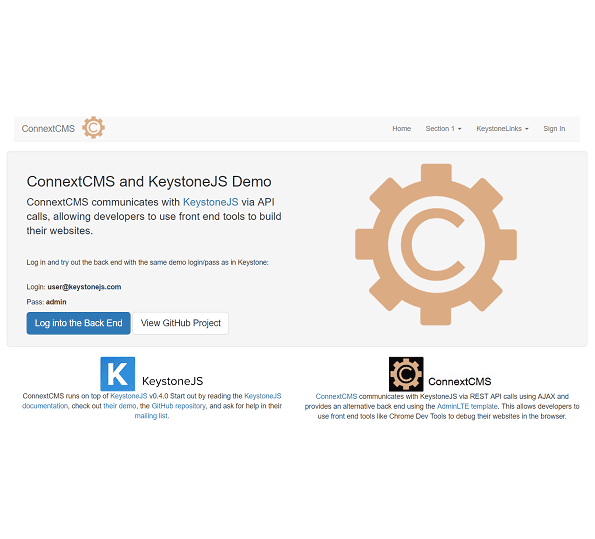 The software is packaged as a plugin for ConnextCMS. 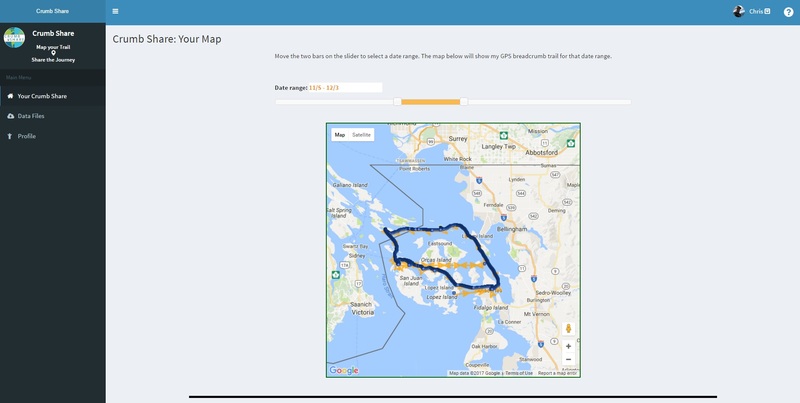 A screenshot of the Crumb Share dashboard showing the breadcrumb trail of a sailing trip I took around the islands. Crumb Share is both a website and a web app. 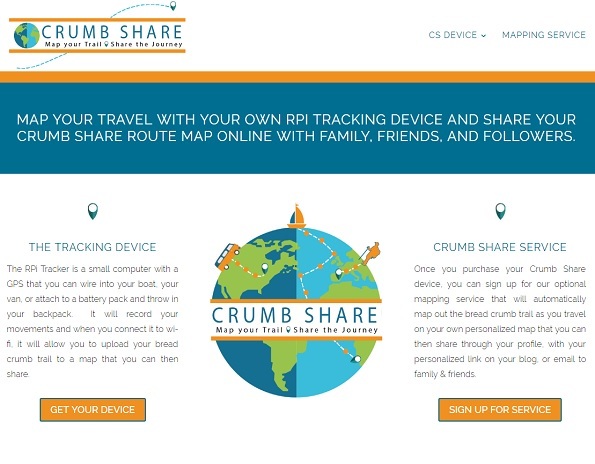 Crumb Share is a service that works in conjunction with the RPi-Tracker, a small tracking appliance. The business targets travel writers, travel bloggers, and people who adventure in boats and vehicles who want to easily share a breadcrumb trail of their travels on social media. Both the Crumb Share service and the RPi-Tracker device are spin-off products of RPiOVN.org. I created the device and started the service with a friend and fellow website designer. ConnextCMS is used to run the site as well as handle the upload of data from devices scattered across the globe. The devices automatically sync up with the server any time they come within reach of an internet WiFi signal. The users breadcrumb trail is displayed on top of a Google map. Users get a link they can use to share their map on social media, or a simple line of code they can use to embed it on their website. Create an account and check it out for yourself! 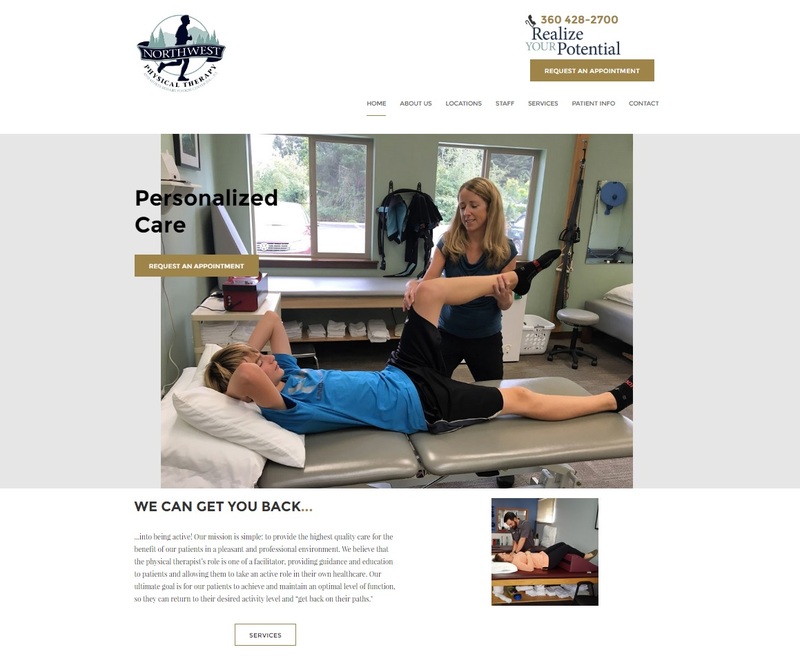 Physical Therapy Northwest is a chain of three physical therapy clinics in Washington state. I built this site as part of my job at Skagit Connext. 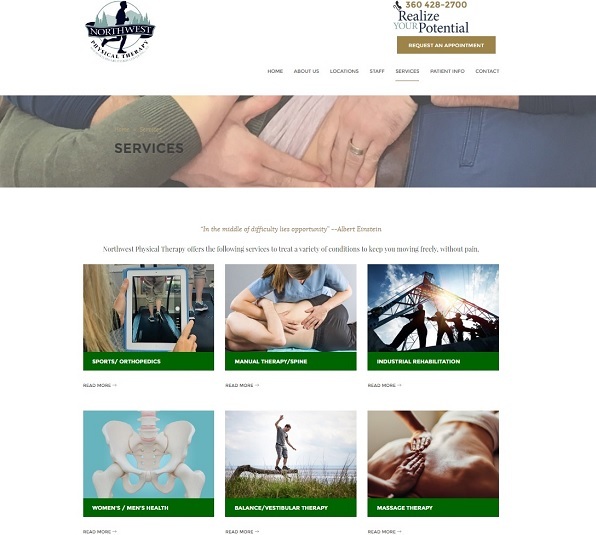 The client wanted their site to have a 'Northwest' feel to it, and had a series of pictures that they wanted to use for the large slider on the home page. This site is hard-coded as HTML without any Content Management System (CMS) like WordPress or ConnextCMS. The service and staff pages include modals that pop up to reveal additional information within the same page. The site is integrated with 123 Contact Forms for secure, encrypted communication of online patient data and payment information. Island Floral was the first commercial site I built that used ConnextCMS for the content management system (CMS). The store owner did not own a computer and needed to update her site using only a tablet or smart phone. The software I wrote allowed her to take a picture with her device and immediately replace one of the images on the site with it. 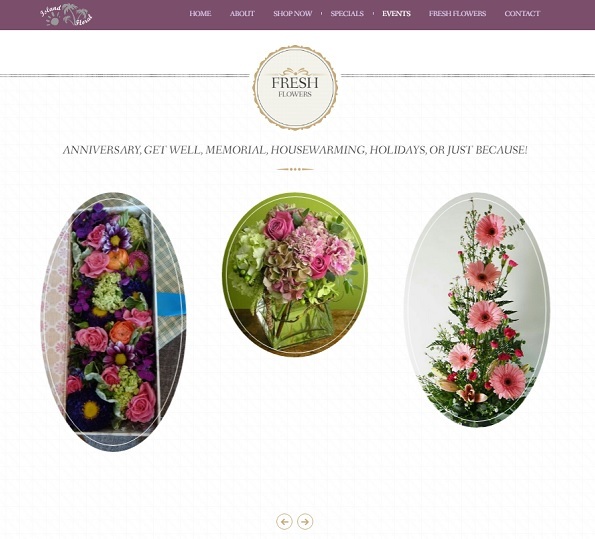 That allowed her to easily update the website with fresh images of the bouquet designs she had in stock. That software eventually became ConnextCMS. The site was recently rebuilt by another website designer, but a backup of the original website I designed is still viewable by clicking on the button below.